Cassini is eBay’s search engine algorithm. It’s similar to Google’s algorithm in many ways. How so? Because it’s not afraid to show duplicate content since it assumes a buyer wants to see multiple results for the same product. Is the listing actually relevant to the buyer? Does the listing provide detailed information that a buyer needs? Will a buyer find the listing educational or is the goal of the listing to make a sale? And in order to make those assumptions, Cassini looks at things like the listing title, detailed item information, eBay categories, and the catalog listings. Cassini also analyzes the seller to determine if they are reputable. The algorithm looks at things like experiences of past customers, reviews, and whether the seller is trustworthy. The days of stuffing your listings with keywords are long gone. The modern version of eBay requires you to think about two types of SEO: product SEO and seller SEO. Product SEO involves the products you are trying to sell. The easiest ways to improve this is by creating relevant listings and descriptions, and including high-volume keywords and high-quality images. When you create customer-friendly listings, you will increase your chances of ranking higher. Seller SEO revolves around the quality of a seller. The best sellers are those that provide value to their customers. Qualities, like quick response times, positive feedback, return policies, and overall customer satisfaction, are the main factors for this type of SEO. Cassini looks at both of these aspects because the eBay experience includes both buyers and sellers. Buyers want to find relevant products from reputable sellers that they can trust. The eBay search algorithm searches for the ideal candidates based on specific factors that go into creating this relationship. Now that we understand the basics, let’s dive into what you need to do to optimize your listings. Your listings are important, but finding the right products to sell is even more important. Anyone can create listings according to a set of guidelines. No one is going to buy your products if they aren’t in demand. Product sourcing is one of the most essential things you can learn to do right. You have to sell products that your customers actually want. Product sourcing is also one of the hardest things to do right. That’s why you need to learn what makes a product worthwhile in the first place. Demand level: Products need to be in demand. If no demand exists, a product will struggle to sell. Competition level: A little competition is healthy and can validate a product. Too much competition is bad and will make it hard for you to compete. Expenses: Every sale you make will have expenses. You have to consider the cost to source, list, ship, and restock your products before you buy them. Profit: Without profit, your business will not grow. Products need to have high enough profit margins to make them worthwhile. Sales volume: Knowing how well a product is performing is invaluable during product sourcing. It will tell you how long you will have to wait to get a return on your investment and when you will have enough sales to buy more. You must learn how to find this information for any product you are considering. It doesn’t have to be. That’s why it’s important to find an eBay product research tool that can do all of these things for you. You don’t want to be spending your time doing manual product research, your time can be much better spent if you get your research done automatically in an instant. Keyword research is something many sellers hate to do. But as much as you may hate it, it’s still vital. 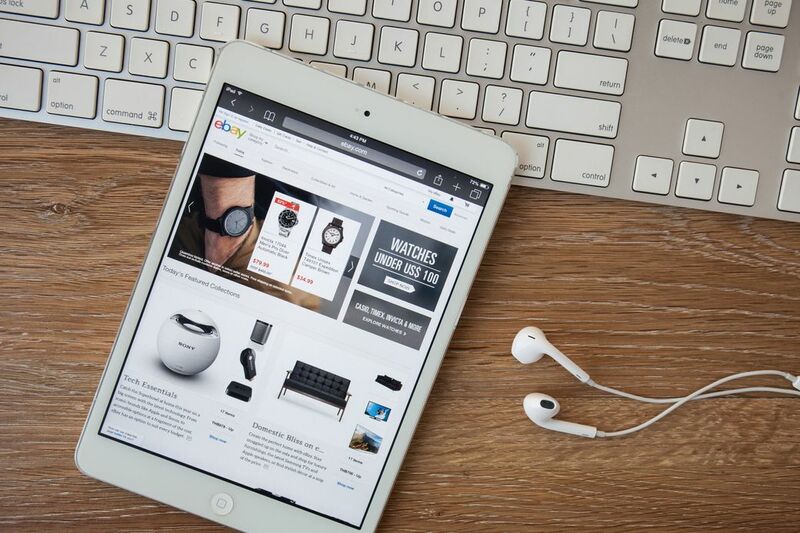 The most successful eBay listings rely on relevant keywords with high volumes. Why is this listing effective? 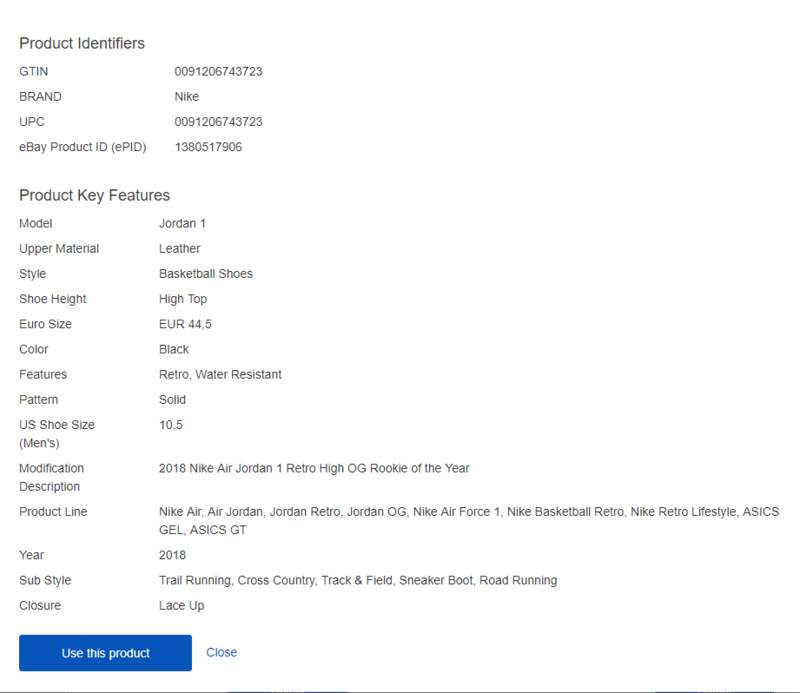 It has the main keyword, “Nike Men’s Air Jordan Retro Sneakers,” and it describes the size and color of the shoe. The pictures also show the shoes from various angles. All of these factors are important and help satisfy the product SEO requirements we mentioned above. What about the seller SEO? In this example, the seller has 100% positive feedback, reasonable shipping prices, all relevant product details like its GTIN, model, European size, year, and more. You can start by looking at what the top listings in your category are doing. See what keywords they are using in their titles and descriptions. When you have a list of keywords, search for them using your preferred keyword tool. Google’s Keyword Planner is always reliable, while Algopix will show you the most-effective keyword phrase on Google for a particular product. And then there are LSI (Latent Semantic Indexing) keywords. LSI keywords are specific words that are directly related to your main keywords. If you were selling books online, a search engine has many options to consider when classifying your bookstore. It could list you as a bookstore, a book author, a book fan club, or any other term related to books. Your LSI keywords help the search engine narrow down what you are doing. For example, if it sees the words “new,” “used,” “buy,” or “sell,” a search engine will likely conclude that you are selling them. In contrast, if it sees “favorite,” “amazing,” or “fan club,” it’ll likely classify that page as a book fan club. LSI keywords are your friend. Think of them as a great way to tip the search engine algorithm off that you are a seller, what you are selling, while still providing value to your customers. It’s a win-win. Optimizing your listing titles is fairly straightforward. The general rule is that you place your keyword at the start of the listing, and the descriptors at the end. More is always better when it comes to eBay listings. It’s no secret that eBay is trying to compete with Amazon. The company is working hard to overcome the stigma that it is a used products marketplace. Because of this, eBay is now rewarding sellers who take the time to create detailed listings for their products. It’s important that you fill out everything you can find. Most of this information can be found from the manufacturer, or by using a product analysis platform that includes important product details for you. The more complete you can make your listing, the better your chances that it will show up in the top search results. Remember, eBay wants to be recognized as a legitimate marketplace for new and used goods, and they see detailed listings as a way to help establish legitimacy. There are many categories on eBay. The last thing you want is for your product to be listed in the wrong category. When choosing your categories, choose the ones that are most relevant. Don’t overextend and place your items in obscure subcategories if you don’t have to. There’s no need to refine your listings any more than you have to. Images are the first thing buyers see when browsing for products on eBay. You must show high-quality product images. It’s not an option anymore. If you want to increase your CTR, high-quality images are the easiest way to do this. Depending on what you are selling, try and take your photos in a professionally-lit setting. For smaller products, you can make a custom lightbox that will increase the professionalism of every photo you take. If you can’t take images yourself, your product research platform may be able to point you to these as well. Just make sure that they accurately represent the product that you are selling and that you have the rights to use them. Equally as important, you also need to create appropriate alt tags for your images. Search engines can’t look at your images. Instead, they rely on the alt tags to tell them what the image is about. More is better. You’ve likely recognized this theme by now. Cassini displays search results in a split second. You need to do everything you can to leverage the algorithm so your products will show up at the top. If you sell a distinct category of products, take the time to create a good store description. It’s an easy opportunity to get in a few important keywords. As important as product SEO is, you also need to boost your seller SEO. That means you also have to prioritize your buyers’ experience. When you take the time to provide exceptional customer service, you not only humanize yourself to your buyers, but you increase the chances that they’ll leave you positive feedback. We already mentioned how positive feedback is an important ranking factor for seller SEO. As a seller, you need to do everything you can to earn it after each successful sale. No one said it was easy to optimize your eBay listings. There are a lot of factors to consider when it comes to improving your eBay listings and selling on eBay.. There are a lot of eBay sellers that do the bare minimum. If you find the right eBay seller tools and follow the above advice, you’ll have no trouble creating optimized listings that outperform your competition.